Qualification to the Memorable Order of Tin Hats, as documented in “Annexure B ” of MOTH Standing orders. In any War prior to 1939 as a member of the fighting forces, including medical or other auxiliary units of such forces. This includes all wars and campaigns in any country. In the 1939-45 War and subsequent campaigns as members of the Union Defence Force outside the borders of the Union on active service. As full-time members of the Union Defence Force, in the Coastal or Coast Garrison Artillery and the South African Air Force Squadrons engaged in seaward patrols. This includes ex-members of the Radar Service and Coastal Crash Boat crew serving with the Artillery Batteries and SAAF Squadrons mentioned above. As full-time members of the South African Naval Forces outside the Union or in the coastal defence of the Union. As members of the British or Allied Forces – air, navy or army – Great Britain or abroad. NOTE: In Britain the Home Guard and National Fire Service are not classed as armed services. As officers or ratings in ships of the Allied Merchant Service at sea during World War I and World War II and minor campaigns mentioned in paragraph As full-time members of the Air Auxiliary Services of the Allied Forces (such as the BOAC) who served in combat areas in support of the Allied Forces in World War II. With the Underground Resistance Movements (Partisan Forces) during the World War of 1939-45 on the side of the original Allies. As full-time servicemen or women in minor campaigns, viz. Korea (1950-53), Kenya (1952-56), Malaya (1948-60), Cyprus (1955-59), Suez (1956-57), Palestine (1946-49), Yemen (Aden Protectorate) (1964-67), Western Malaysia (Sabah, Sarawak, Brunei) (1962-68) with the British Forces in Ireland (1969 -) who are in possession of the General Service Medal and/or Northern Ireland Clasp. The guerrilla warfare in which Rhodesia was engaged 11.11.65 until 05.03.80, members of British Forces in the Falkland Island Campaign 02.04.82 to 14.06.83; members of American Forces and their Allies in Vietnam from 22.12.61 to 07.05.75. The Northern Rhodesia, Southern Rhodesia and Nyasaland Federation Emergency Mobilization (February 1961- February 1962). 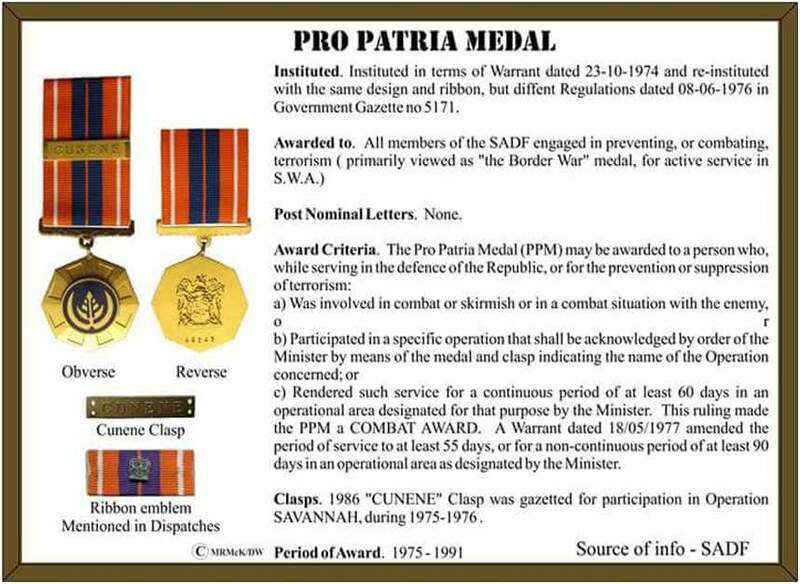 As members of the South African Police or Rhodesia Police (11.11.65 until 05.03.80) who have been in active operation against guerrillas on their Borders and who are in possession of the South African Police Medal for Combating Terrorism or the Rhodesian General Service Medal. In Vietnam as members of the Allied Forces (as recognised for eligibility for the 1939-45 World War). As security force members – (Definition- A member who was a member of the South African Defence Force or the South West Africa Territory Force (01st August 1980 to 30th June 1989), the South African Police or South West Africa Police. 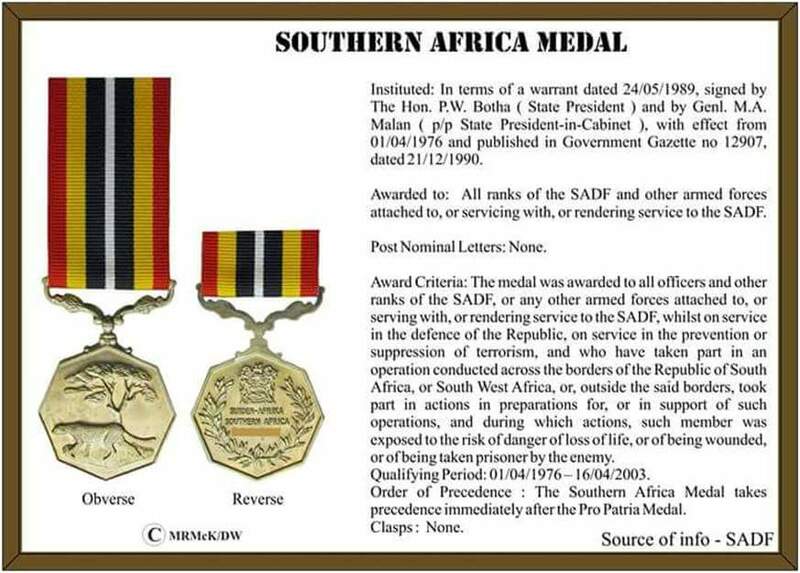 who served in an operational area, namely South West Africa, Angola, Mozambique or the South African Borders. who have been directly engaged in operations anywhere in South Africa from 01st January 1983 until 02nd February 1990. As members of the SA Navy at sea, the Operational Area (January 1975 to February 1990) is on the West Coast of Africa from the Equator down and around the continent and up to Pembe Island (off Tanzania) on the East Coast. As Security Force members actively engaged in urban and rural operations after 02nd February 1990 and up to and including 27th April 1994. 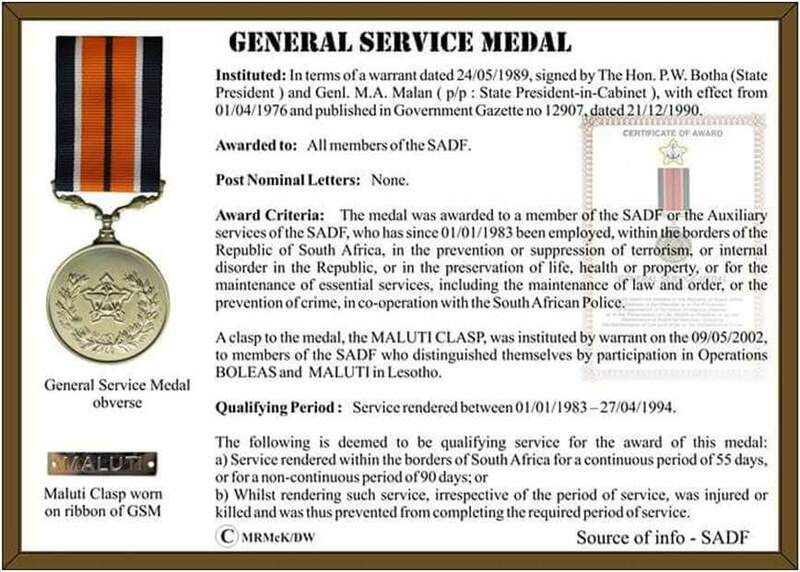 Members of the SANDF who since 1994 have received a campaign medal or May09 clasp issued by the Joint Chiefs, Operations Support for any military operations. These to include peace keeping forces and operations in: Lesotho, Democratic Republic of the Congo, Burundi, Mozambique and Sudan. These Campaigns will be updated from time to time at GHQ meetings. Allied Service Personnel who fought in Operation Desert Storm. Allied Service Personnel who fought in the Iraq War/Balkans Conflict (NATO Forces)/Afghanistan. Allied Service Personnel who served/currently serve in NATO Forces operations, and are in procession of a service/campaign medal or the necessary proof confirming that the person took part in the operation.